A flawless performance from Spaniard Carla Suarez Navarro saw her breaking Maria Sharapova's unbeaten streak at night, ousting the Russian 6-4, 6-3 to seal a quarterfinal spot. 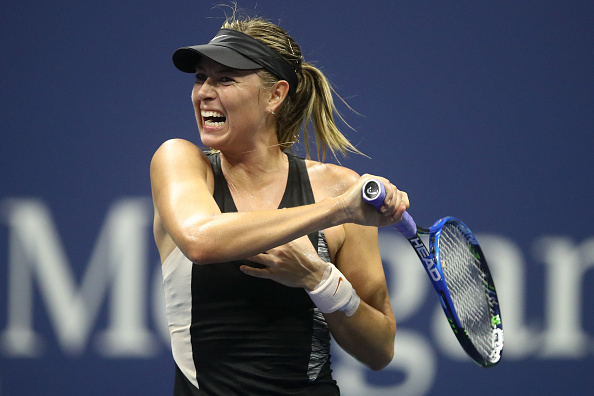 Former world number one and five-time Grand Slam champion Maria Sharapova’s unbeaten streak during the night session at the US Open came to an abrupt end as she shockingly fell to the unheralded 30th seed Carla Suarez Navarro under the lights of the Arthur Ashe Stadium in straight sets. Sharapova, who put in a disappointing performance which made her night session record stand at 23-1 now, will fall two spots in the rankings after matching her result from last year. 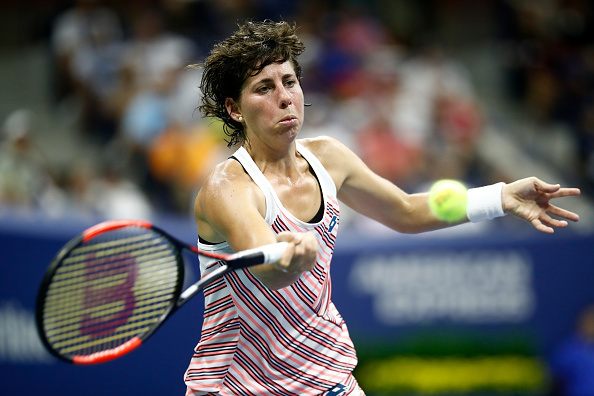 Suarez Navarro put in a solid performance and is now nearing a return to the top-20, and she will face home favourite Madison Keys, who is also the defending finalist this year in Flushing Meadows. The birthday girl, who turns 30 today, reaches just her second US Open quarterfinal and that came after putting up an incredible display of counterpunching tennis. Sharapova’s 38 unforced errors proved to be costly during this one-hour and 31-minute encounter, and despite a high first serve percentage of 69, she won less than half of her first-serve points, something rarely seen from the Russian. Suarez Navarro was clean off the ground and committed just 20 unforced errors throughout the match. With this win, she becomes the first player to defeat Sharapova at night in New York. It was a confident start from Sharapova as she found some good serves and looked solid on the baseline, and was poised for the victory she was tipped for. However, things turned out otherwise as Suarez Navarro fended off multiple break points in her opening service game and gained the momentum. Sharapova’s serves started to crumble and she failed to find her first serves consistently in the first set before three consecutive double-faults saw the Russian being broken twice successively. Suarez Navarro stormed towards a 4-1 lead with a double-break advantage but was pegged back as her vulnerable serves were exposed by the aggressive Sharapova. However, the former world number one was sloppy on her serves and lost her serve once again, gifting Suarez Navarro a commanding 5-2 lead. Despite Sharapova’s toughest efforts to lessen the deficit, she threw in four consecutive unforced errors from being 0-30 up at 5-4, allowing Suarez Navarro to overcome her nerves and clinch the first set 6-4 after 44 minutes of play. A quick exchange of breaks started the second set but it was Suarez Navarro who stepped up her play and produced some incredible defence to match Sharapova’s power, clinching three straight games from 1-2 down. The Russian earned break points in the seventh game but failed to convert as she sent her returns straight into the net, wasting the golden opportunity to return level. Serving to stay in the match, Sharapova owned a 40-15 lead but an error alongside a double-fault derailed her momentum. Ultimately, a fantastic unreachable backhand winner by Suarez Navarro closed out the impressive and stunning upset over the 22nd seed, securing the best birthday present ever.